The Chrome Grid Connector connects two wire grid panels together. 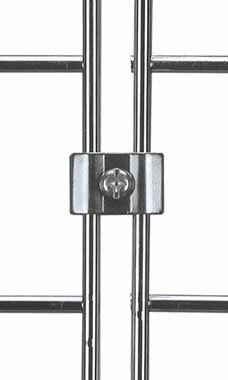 The connectors feature a unique two piece wavy design with a bolt through the middle. This design allows for the connectors to join panels together with a tight secure fit. Once the panels are joined the grid connectors allow the panels to open and close like an entry door with a hinge. We recommend using three connectors for every two panels.